He faces up to 50 years in prison if convicted on all charges. 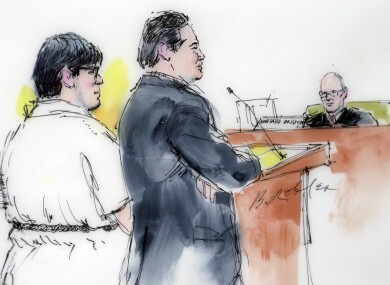 In this courtroom sketch, Enrique Marquez, left, appears with his defense attorney Young Kim in federal court in Riverside, California. ENRIQUE MARQUEZ, THE man accused of purchasing the two assault rifles used in the San Bernardino shooting that left 14 people dead, pleaded not guilty today to terror-related charges. Marquez, 24, was indicted last week by a federal grand jury in California of conspiring to provide material support to terrorists, lying about the purchase of the two weapons used in the 2 December shooting, marriage fraud and lying on the visa application for the woman he married. During his brief arraignment in federal court in Riverside, Marquez, who has been held without bond since his arrest last month, simply said “not guilty” when asked how he wished to plead. According to the charges against him, Marquez in November 2011 bought a Smith & Wesson assault rifle and three months later purchased another rifle. Both weapons were allegedly purchased on behalf of Sayed Farook. Authorities say he and his wife Tashfeen Malik used them in the attack at the Inland Regional Center in San Bernardino that wounded 22 along with the 14 killed, many of them Farook’s former co-workers. Marquez in 2011 and 2012 also allegedly plotted with Farook to carry out terror attacks at an area college that both men had attended and on a busy freeway. Marquez, a long-time friend of Farook — Marquez converted to Islam after Farook introduced him to the religion — told investigators that both plots were abandoned and he eventually distanced himself from Farook. He also allegedly entered into a sham marriage with a woman linked to Farook’s family in November 2014 and lied on her visa application. Marquez, who has cooperated with authorities, is set to be tried on February 23. He faces up to 50 years in prison if convicted on all charges. Email “Friend of San Bernadino shooter pleads not guilty to terror charges”. Feedback on “Friend of San Bernadino shooter pleads not guilty to terror charges”.